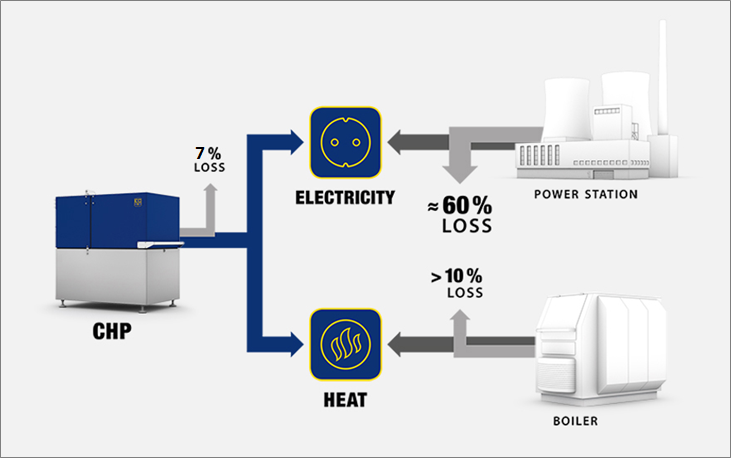 What is CHP Cogeneration? | Aqua-Tech Sales and Marketing Inc.
Home / What is CHP Cogeneration? A Great Way to Grow Your Business’ Bottom Line. Using natural gas as a fuel, a commercial facility with a XRGI25 cogeneration system can produce both energy-efficient heat for supplemental space heating and / or domestic hot water and electricity to reduce energy consumption from external power sources. Using an internal combustion natural gas engine, Micro CHP (< 50 kW/hr), is designed to be an efficient and easily installed system ideal for light commercial use such as multi-family residences, hotels, hospitals, colleges, restaurants, car washes and swimming pools, the XRGI25 aims to meet the growing need for enhanced efficiency and reduced energy waste in North America. In Europe where a large percentage of electric generation capacity comes from cogeneration. There are over 7,500 XRGI25 Micro CHP units already installed. What is Cogeneration - µCHP? or mobile 905-246-3516 and talk about a great way to do it. Product is available from Wolseley.